Sometimes writing about games gives you the opportunity to write about other things. We regularly receive PC and console peripherals, and we've racked up quite a few headphone reviews over the years, but furniture? That's new to me. 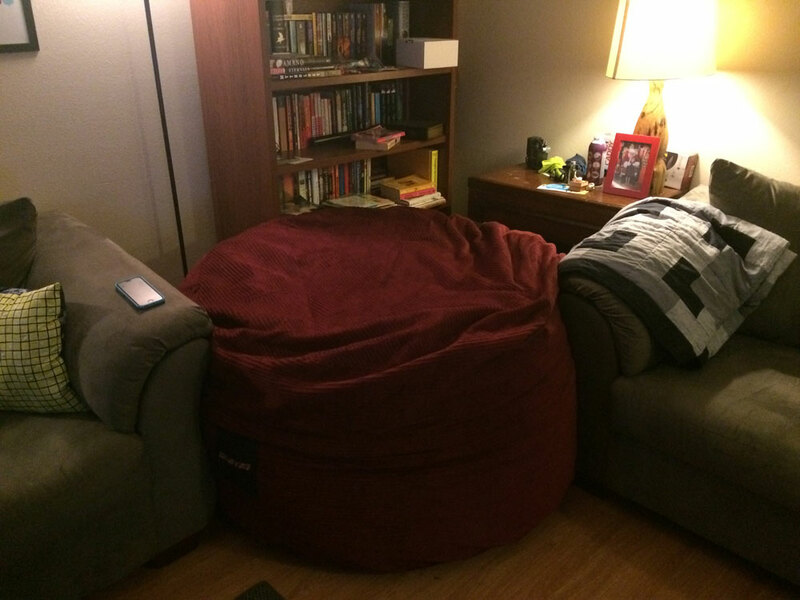 Recently, the folks at Sumo sent Co-Optimus HQ their Sultan, a large, stylish beanbag chair meant to be the ultimate place to relax in your home while you game, watch TV, or generally be as slothful as possible. I've had it for about two weeks now, and have put it through just about all the paces. The Sultan definitely large, measuring about 5' x 5', so it'll take up quite a chunk of space. Luckily, my living room had a perfect corner next to the bookshelf to place it. After marveling at the sheer size, my wife and daughter both took turns laying in it and ended up molding it into a bit of a chair shape. By the time I was finally able to get a turn, it was like sinking into an ultra-comfortable lounge chair. We received the corduroy model, which worried me slightly since my part of the country is in the middle of a heat wave and most folks don't have air conditioning. I'm pleased to report that even in the summer heat, it's still comfortable to lounge on. 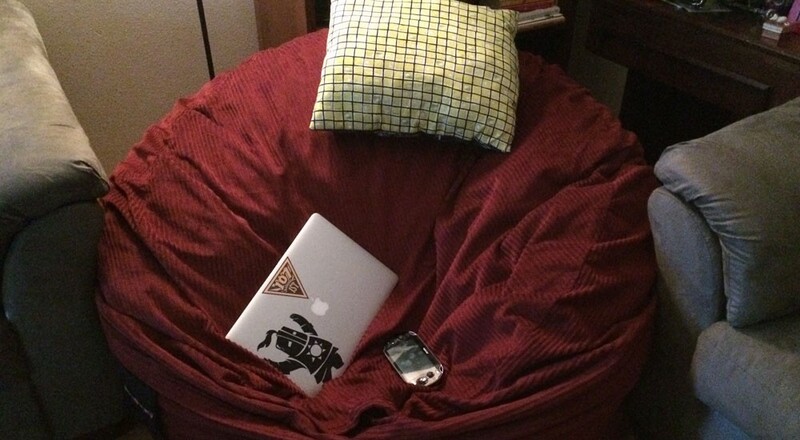 Though labeled as a bean bag chair, the Sultan is actually filled with shredded foam, which makes for a softer and (in my opinion) more comfortable experience than traditional beans. Not too firm, not too soft. For my personal firmness requirement it's just right. It never got uncomfortable after a long gaming session, even with a second person on board. It retains its shape quite well and is always fairly easy to "reset" its shape if you need to. Due to its size, the Sultan works fairly well for local co-op sessions. Two average-sized adults can fit comfortably on it, as can about four children, as I witnessed to my horror a few days ago. If you ever want to know true fear, let your child have several friends over and watch as your new beanbag chair becomes a stylish piece of playground equipment. You'd think I installed a ball pit or something. In any case, while two adults fit on it, you'll probably want to be pretty comfortable with each other, as you'll naturally sink close to one another (my wife appreciated this feature). Since my very first experience with a Sumo was in the handheld lounges at PAX Prime, I've got it in my head that these work best for handheld gaming, and as such, I spent a ton of time playing my 3DS and Vita (sneaking in some remote play while my daughter used the TV). A word of warning: if you have a child or a pet, you will not get to use your new Sumo too often, for you will often find it claimed. 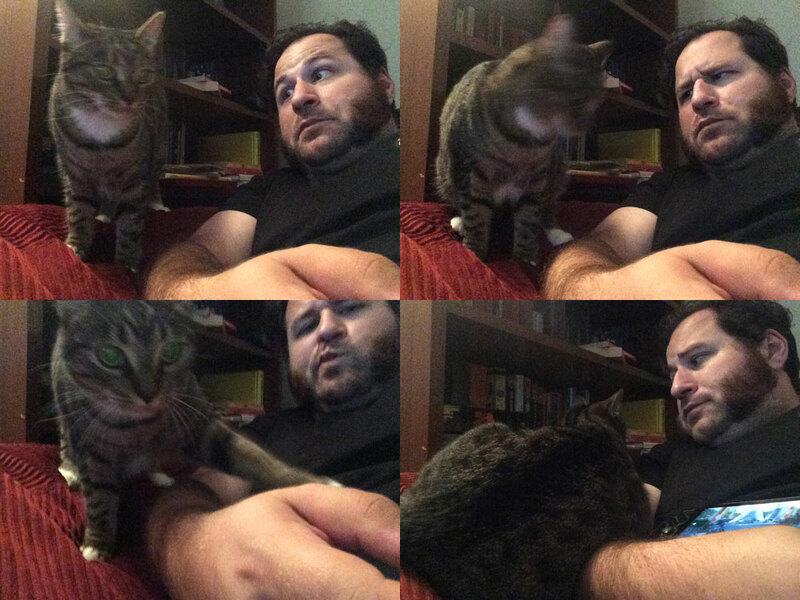 Every time I tried to use it to game or watch TV, I had at least one other companion at all times. Good thing its size allows it to comfortably seat two people. If pets or kids get it dirty, you can remove the outer cover for cleaning. "It's good. It's comfy. I like to sleep on it. I like to flop on it and sing." I asked her if she liked to be on it with other people and was met with an emphatic "YES!" I also tried asking the cat, but she stared blankly at me before rolling over and ignoring me. I think she likes it as well. All in all, the Sumo Sultan has made a fun addition to our living room. If you have the space, and the desire for something different than a traditional chair or loveseat, I think you'll dig it. Page created in 1.0817 seconds.